No two pest situations are the same. In order to combat them effectively, Clark Pest Control will come up with a customised plan for maximum impact. In order to do this, we have amassed a number of technologies, equipment, and techniques in our arsenal. Because of our diverse approach to bird control, we can tackle any problem, with any species, in any environment. To arrange for our technicians to come out and help you with a nuisance bird problem, give us a call today on 0800 808 5615. Spiking is one of the most effective and efficient options for dealing with nuisance birds. These spikes for a physical barrier which will leave the bird entirely unharmed while making it impossible for them to land. Spikes are incredibly versatile and can be attached to almost any surface. Their durable stainless steel and UV-stabilised plastic bases mean that they will be there to stay and, so long as they are correctly installed, will not need to be replaced for years to come. 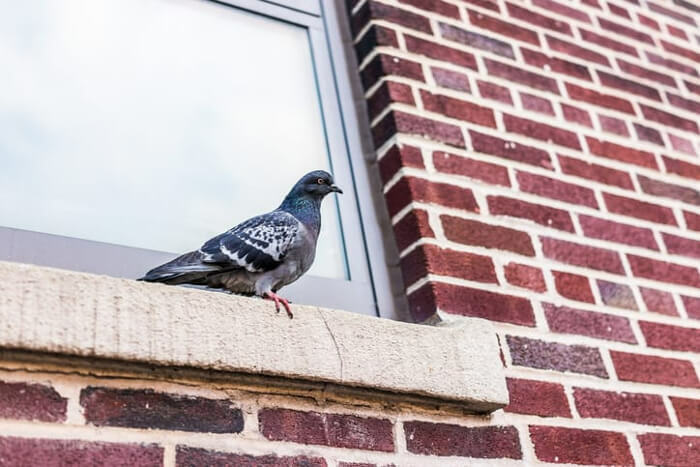 By altering which product we use, we can optimise the spikes for dealing with either urban gulls or pigeons, ensuring you see quick and tangible results. Bird gel is a particularly interesting solution which serves as a very discrete option. The gel used in bird proofing appears like fire to birds, which will, naturally, make them too scared to land on any surface where the gel has been placed. For any birds which are feeling brave and make the plunge into what they see as a burning rooftop, will find that the gel also has an incredibly unpalatable taste and smell. The combination of this and the fire will make sure that no bird will stay around for long. The gel is non-toxic, which means it won’t do the birds any harm and is entirely safe for the environment and any other critters which might be running around. In addition, the gel forms a protective film over itself which means the rain will not wash it away. Since the gel merely sits in little capsules, a few millimetres high, they cannot be seen from ground level. As such, they are a fantastic option for historic buildings. Bird Netting is one of the most comprehensive methods of protecting a building against pest birds. It is popular for a reason and being effective is just one of the many benefits it offers. Bird netting can deal with any form of urban bird and will stop potential roosting birds from accessing problematic areas of a building. From office buildings to factories, multi-story car parks, and a number of other structures, netting can be installed by our technicians in a huge variety of settings. Moreover, when installed correctly, netting will serve as a very subtle solution. From only a few metres away, the net will be almost invisible, blending into its surroundings. In addition, it is incredibly hard-wearing and can withstand even the most extreme weather conditions while remaining entirely unaffected. From snow to high winds and beating sun to heavy rain, the durable mesh will stay where it is and continue to do its job. One of our more technologically solutions involves lasers. Like any animal, when a bird sees something coming towards it, the pest will flee the scene. If this happens repeatedly in the same space, then the birds will eventually leave the area entirely and roost somewhere more peaceful! The birds see our lasers as a threat and will react in the same way as they would to a physical object or living thing coming towards them. When the lasers are employed for an extended period of time, they will reliably make sure that no birds of any kind try to roost within the protected area. Lasers are utterly harmless to pest birds and are entirely chemical-free. Additionally, they are altogether silent which makes them a non-invasive option for built-up urban areas. Lastly, the lasers we use have an incredible range. When utilised correctly, they can protect an area which is around 10km2. One of the more exciting and specialised options which we provide at Clark Pest Control is Falconry. Although this is one of our less commonly used solutions, in many situations it can prove to be an impressively useful and frankly fascinating technique. Naturally, birds will quickly flee when they see a predator nearby. By employing a trained bird of prey, the disciplined predator can patrol an area and make its presence known. After a short time, the birds will begin to realise that their lives are in danger and the appropriate thing to do is to leave – and leave quickly! Having pest birds on your property can rapidly lead to a number of problems. Not only can they be irritating, through noise and occasional harassment, but they can cause severe hygiene issues through the spread of disease. Additionally, they will cause extensive structural damage due to the acidic nature of their droppings. Clark Pest Control offers a dynamic, cost-effective, and efficient service which will make sure pest birds quickly become a problem of the past. To get in touch to discuss what we can offer you, give us a call on 0800 808 5615. Alternatively, fill in our contact form, and one of our operators will be in touch as quickly as possible.